The best holster works better when supported by a solid belt designed specifically for carrying a firearm. The CrossBreed® Crossover Belt is the perfect pairing of style and function featuring the best belt materials and exceptional buckle quality. CrossBreed® has designed a sturdy yet dignified slide buckle that is stylish enough for formal wear or robust enough to work in the woods. The belt is custom made to your exact specifications using your choice of two leather colors, five stitching selections, and six buckle finishes. The slide buckle design means no holes are needed in the leather, which gives a large range of size adjustment. With CrossBreed®’s handmade quality look and feel, this belt will find a niche’ in your dress wardrobe as often as your daily carry. CrossBreed® belts start with hides specifically tanned to the specification of Crossbreed®. Once these hides are in house they are cut into 1.5" width belt strips and hand leveled to ensure an even thickness. Each strip is matched cross grain with a premium 7 oz leather liner using industrial adhesive. Each belt is then hand beveled, hand burnished, hand edge dyed, and then recessed stitched with Fil-Tec premium nylon 277 thread. The belts will be approximately ¼” thick resulting in a strong belt with superior support for carry while still offering the flexibility for comfortable every day wear. Founder's Series Belts feature an 7oz outer layer made of a 100% vegetable tanned leather using no dyes or lacquers. The hides then have natural oils and tallows applied under pressure giving each piece of hide a unique and distinctive appearance. The leather pieces range from a dark chocolate brown to a lighter tan with contrasting grain. The natural oils accent the grain and structure of each piece, resulting in a beautiful holster or belt that will withstand moisture, sweat, and environmental conditions. These oils also aid the leather in forming to your body when worn, resulting in a very quick break in period. Due to the natural character of the leather, each belt will show wear and use from the holster and the owner. Over time these marks will accent the rustic feel and look of the Founder's Series. Each Founder's Series Belt will come with a care kit containing a bottle of dark saddlers oil specially formulated to bring back the original rustic look and feel. The Founder’s Logo is going back to our roots when Mark Craighead stamped a simple cross on each holster to symbolize his faith and devotion. We have combined the original cross stamp and Mark's signature to set apart the Founder's Series of holsters and belts. 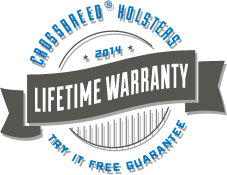 The CrossBreed® Crossover Belt has a wide range of adjustment. Please measure your waist size, NOT pant size, prior to selecting your size. 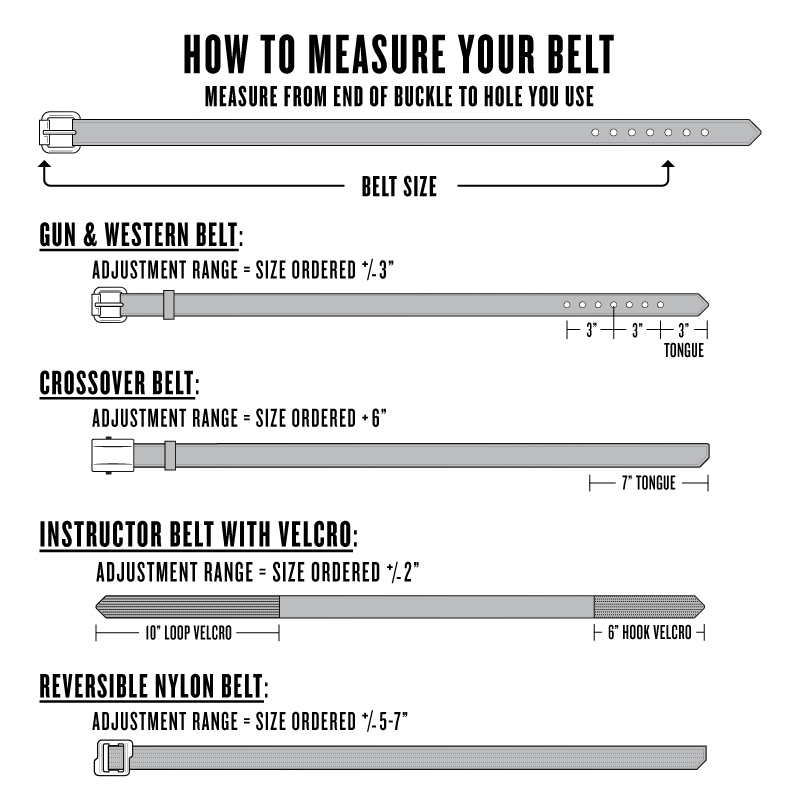 To obtain your belt size, measure, in inches, your EXISTING BELT from the end (far tip away from the leather end) of the buckle to the hole that fits you the best. This measurement is your belt size. The Crossover belt will have a 7" tongue from this size when worn. The leather will measure the size you select plus 7" in overall length.